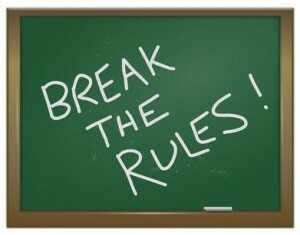 Look at the most successful entrepreneurs and you’ll see them break these rules again and again. Small is the new big. At least it is when it comes to mindset. That’s what I have concluded after spending a good part of the last two decades working with Fortune 1000 CEOs and the leaders of companies actively participating in groups like Young Presidents’ Organisation and Entrepreneurs’ Organisation. Whether your company is big or small, everyone seems to be intent on capturing the inventive mojo of the start-up. The reason is simple. According to experts, as much as 54 percent of a company’s share value is based on ideas—new products, services and business models—that haven’t been thought of yet. And with the rate of change coming faster and faster, companies big and small must learn how to move with the gazelle-like speed of the entrepreneur. With this in mind, here are four business rules that I see entrepreneurial-minded leaders consistently break. In my early years as an entrepreneur, I saw everyone as a potential threat or competitor. With a paranoid frenzy fit for a seal during Shark Week, I closely guarded our company IP, strategies, practices and client lists. Then I started to notice something: The youngest successful entrepreneurs I knew were sharing everything. They shared offices, they shared code, they shared cars, they shared strategies, they shared…. When the young founders of Airbnb decided that they could scale the idea of “sharing” their San Francisco loft with people who needed a room for the night, traditional hotel operators thought they were nuts. Five years later, they have more than 300,000 properties available in 192 countries. They are also credited with being pioneers in the sharing economy. The lesson: The consumer wants to be collaborative. You should too. Years ago, in an effort to offer a really cool employee benefit, we gave people at Maddock Douglas the option of a 7:30 a.m. to 5:30 p.m. workday. We then split the willing participants into two teams. Each team could then use the “banked” extra hours and take every other Friday off. So for many years, having 26 three-day weekends a year was a celebrated benefit. Then something changed. I began to notice that people were rolling into the office at 8, 9 and (gasp!) 9:30 in the morning. I got frustrated, feeling people were cheating the system, and we cancelled the program. What my Gen X Navy brat brain failed to realize was that many of our Gen Y were doing work on the train, from home and even on weekends. I failed to recognize how effectively they could integrate work into their lives, whether they were in the office or not. The lesson: Measure the output, not the time in the office. How do you know when you have a good idea? The answer is simple: People will pay you for it. If you have a great idea, people will pay you a lot for it. Putting your idea to the sales test not only keeps you honest, but it gives you a continual feedback loop to rapidly improve your idea. It also allows you to finance your product as you go. Read: Own more of your company or your idea for longer. The lesson: Raise the real capital once your idea has a proven model, price tag and market. Failing forward is the mantra of entrepreneurs. With every small failure, they feel a step closer to a better solution because they are gaining feedback that makes the product or service more appealing. Big companies are famous for doing internal research to the point where a product is so safe and dull that it has lost the sharp little edges that made it appealing in the first place. Would a big company have launched the Snuggie? Probably not, and they would have missed out on $500 million in sales. The lesson: Don’t ruin good with perfect. If you want a culture of innovators, learn how to test early, fail forward and collaborate with partners. In other words, learn how to act like an entrepreneur.